When you're serious about installing manufactured homes, this is your tool! The CSI House-Tug was designed specifically for installing manufactured housing. 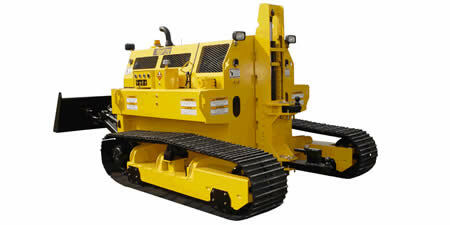 Maneuvering in tight places, soggy weather, and rugged terrain is what this machine was created to do! Pulling heavy loads provided by modern manufactured homes is no problem. With fully hydrostatic drive and the power of its diesel engine, the House-Tug can easily move the heaviest units into place! Lifting from ground level to over 36 inches with a capacity in excess of 26,000 pounds, gives this little machine the abilities of a giant. Fingertip radio remote control allows you to easily walk around the housing unit to check clearance from obstacles, tracking of tires and final positioning of the unit on the pad. The maneuverability and control of the House-Tug will amaze you. It can actually turn around in its own length, and crawl steep inclines to get into and out of places you would never take other machines. The House-Tug's user-friendly radio remote control gives you full control of the little giant. The state-of-the-art industrial control system is weather-proof and extremely rugged to provide many years of dependable service. There are optional attachments available that can help make site preparations quicker and easier. Customize your House-Tug with options like the auger, anchor driver, concrete bucket or dozer blade. 9,500 lbs. approx. 10,300 lbs. 13,400 lbs. © 2019 CSI reserves the right to change information on this page at any time without notice or obligation.